Avery McShane and the Voodoo Witch is the third book in the series, and the scariest one so far. 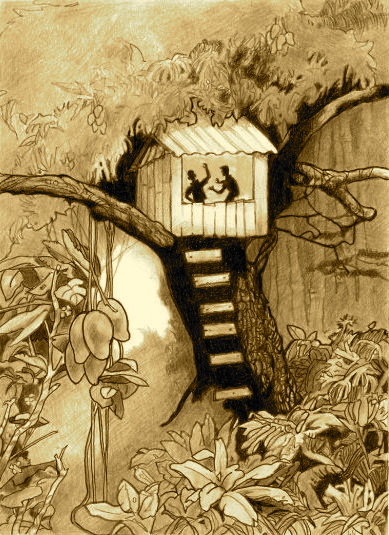 Like all of the books, it starts off in Campo Mata, more specifically, in the treehouse in the huge mango tree. As you know by now, the treehouse is the hideout of the Machacas, the super exclusive club made up of Avery, Billy, Todd, and Mati the dog. My very talented Mom drew the illustration of the treehouse (below). She captured almost exactly how I still picture it. If you look closely, you can see Avery trying to calm Billy down after some adventure that must've gotten out of hand, which always seemed to happen. The original is in color, but this was the only one I could find on my iMac. I'll replace it later. Below the drawing is a photo of a cove and beach on Margarita Island, which is where everything starts to get out of hand. It seems like we Machacas couldn’t go on a vacation without something bad happening, and our sailing trip was no different. Billy’s dad had built a great big wooden sail boat and we headed out from Puerto la Cruz on it with plenty of time to get to Trinidad for the annual Carnival celebration. We anchored that first night in a cove on Margarita Island and, as usual, Todd and Billy and me slept on the boat while our parents slept on hammocks on the beach. Problem was, when we woke up, we found out that some Jamaican pirates had stolen the sail boat. They didn’t even know we were onboard. To make matters worse, we heard them say that they’d be going back with more pirates to nab our moms, and they’d kill our dads if they got in the way. Once we got to Monkey Island where the pirate hideout was, we managed to surprise the pirate that they’d left behind to guard the boat, and we made him walk the plank. We didn’t know exactly how to get back to Margarita Island, but we sure as heck weren’t going to stick around. Then, just when we thought we’d escaped, the Jolly Roger came around the point and started after us. The pirate ship was a lot faster than ours, and we had no choice but to head back to Monkey Island to get away from them. Once we got back into the jungle things really started to heat up, but at least we were in jungle now, and we Machacas knew how to survive in there better than anyone. Then again we couldn’t just keep hiding. We had to save our parents. Problem was, we had an island full of mean characters in the way. Mamba was the leader of the pirates, and he was scary enough, but it was Smiley that really had us worried. Seems he’d been burned really badly when he was young, and he hated kids because he’d been made fun of his whole life for looking like a skeleton with burnt skin. All he wanted to do was catch us and throw us in a fire. And then there was the Voodoo Witch who somehow knew where we were hiding. We finally did get back to Margarita Island, but not before I’d had to spend some time in a scary old pirate cemetery on a full moon night, had a run in with the voodoo witch, and watched a man being burned alive. I even had time to blow up a sail boat, get in a gun fight with the pirates and finally meet up with Mamba face-to-face. I’m still alive to tell the story, but it was sure-as-shootin’ a close call.